The protagonists of the children' s series Doraemon have met to carry out this competition of bicycle races. You can choose your favorite character among Doraemon, Nobita, Shizuka or Giant and start the adventure with him. You must start at the first level and if you win the race you will unlock the next level. You must be very careful because if you suffer an accident that prevents you from continuing the race you must start from the beginning. Do not let any of your rivals go ahead and reach the finish line in the first place. Doraemon and friends are going to carry out the most exciting bicycle races in Japan. 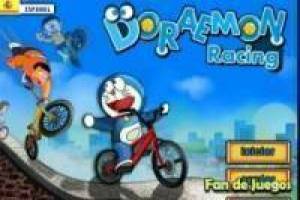 Enjoy the game Doraemon: Bicycle Race, it's free, it's one of our doraemon games we've selected.